We sometimes forget the endless possibilities when it comes to decorating office space or other interior areas. Whether you’re looking to spruce up the décor of a bland space or wanting to utilize an area for branding and advertising, using progressive Graphic technologies, has brought innovative products and ways to do just that. Your Walls, Our Graphics, Your Image! With all the possibilities, how do you begin to construct your vision for the space? 1. Connect your brand to your space: Most of the potential spaces are large and visible, making them a great place to design your graphics around your brand and identity. Here, you can make a bold statement that will lead to a longer impression on the audience viewing it. 3. The RIGHT Company for the job: Combine a creative approach to concept, design and delivery and select the ideal partner for your project. While it may seem like an overwhelming challenge to decide where to begin, Merritt Big Color is prepared to help, making it as easy and seamless as possible. 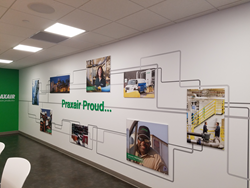 Merritt Graphics BIG COLOR has the expertise and capabilities to print any image, any size, any quantity and on any surface.The ability to fully understand the client’s facilities, history, needs, and budget guarantees a successful graphic exhibit.